Has anyone been inspired by my previous post to try making their own bacon? I hope so, because it really is easy, takes very little actual “work time”, and the results are just incredibly good. Couple that with pork belly from first-rate pigs, raised and treated properly, and you have something that is quite out of the ordinary. One thing I didn’t discuss is that bacon can also be savory. You still need to use some sugar in the cure, but the extra maple or birch syrup doesn’t need to be added. Instead you can use herbs or spices. Try crushed juniper berries, minced garlic, thyme, bay leaves, even cloves or allspice. The results can be amazing. 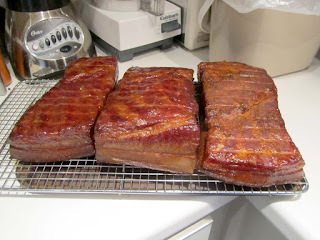 So, last post, I discussed how to cure pork belly. If you’ve done this, you now have some very flavorful bacon with no further work. But you can also smoke bacon (or any meat for that matter) to add another whole layer of flavor. 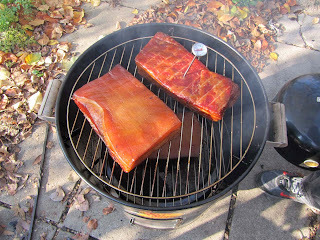 Since we like smoked foods (at the moment, I’m smoking some salmon with a cold-smoking gadget we recently bought), finishing our cured bacon with a few hours in the smoker is a must. 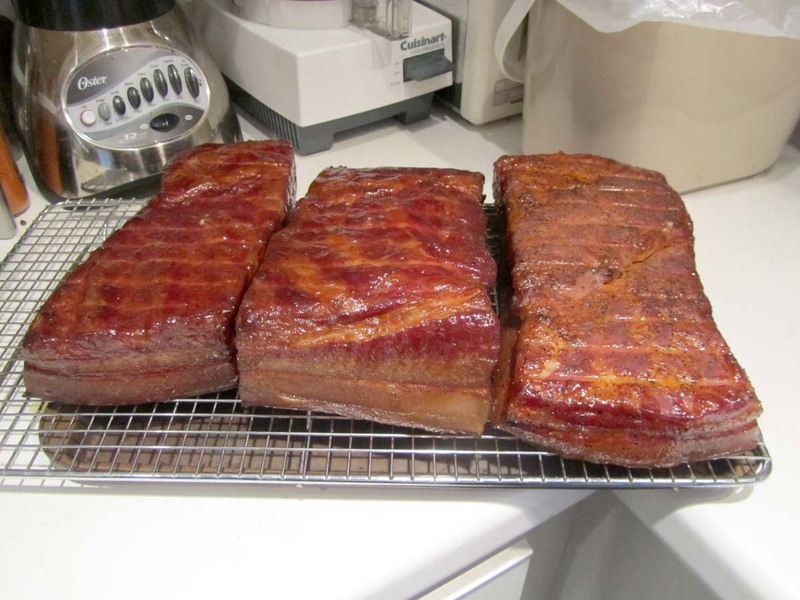 If you smoke your home-cured bacon, I think you will agree. First of all, you need a smoker. They don’t have to be large or fancy. The only requisites is that what you use must be able to keep the temperature steady at around 200-250 degrees (it can vary within the ideal range) and that the vessel used for smoking has a cover to contain the smoke – at least for awhile. You do want it to have a decent draft to keep it going. Never forget that you’re using a fire and fires need oxygen to burn or smolder. Many people successfully use their barbecue as a smoker and while this does work, you have to remember that the heat needs to be indirect, otherwise your meat will do more cooking rather than being bathed in smoky heat. Direct heat will cook your meat too quickly, not giving it enough time exposed to the smoke. If you have a large enough barbecue to have the bacon well away from the source of heat (which, truthfully, shouldn’t be much), then go ahead and use it. Remember: you want indirect heat. 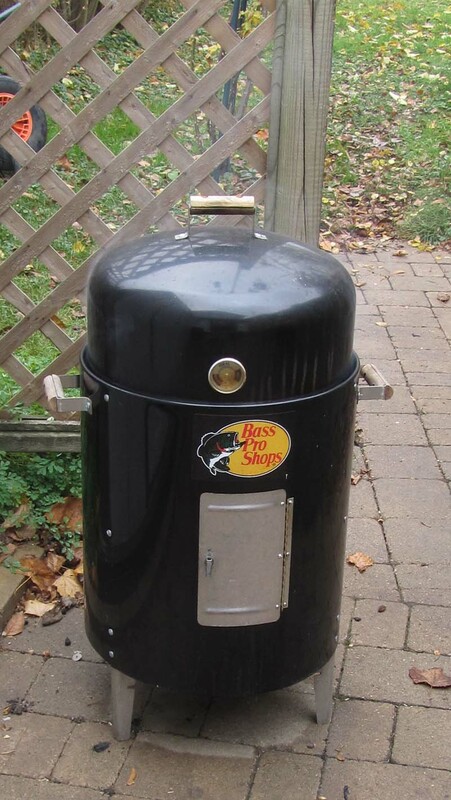 When we decided on purchasing a smoker, we went to look at the one suggested for home smoking in Charcuterie: one made by the Bradley firm in British Columbia. 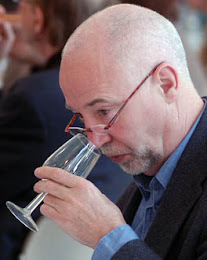 We ultimately decided to take a pass for two reasons: too expensive but we would also be captive to their special wafer chips called bisquettes (made with specially compressed sawdust). If we get really serious about this, we may one day invest in a Bradley. Certainly it seems to be well-made, has a lot of proponents and good reviews. We saw the Bradley at nearby Bass Pro. It turned out they stocked a simple smoker made by a company called Brinkmann. It is very basic, a bit of a pain in some ways (pans can fall out at very inopportune times, but since we like to futz with things, and my son Karel (the master smoker of the family) enjoys nothing more than to tend the fire and watch the smoke rise, it’s worked out very well for us. Best of all, it cost $55 as opposed to $300+ for the bottom-of-the-line Bradley. One modification we did make was to drill five 3/4" holes in the bottom of the fire pan to help with air cirulation to keep the charcoal and wood chip packages burning evenly. The only other thing we did was purchase a cheap oven thermometer so we could more closely monitor the temp in the smoking chamber. 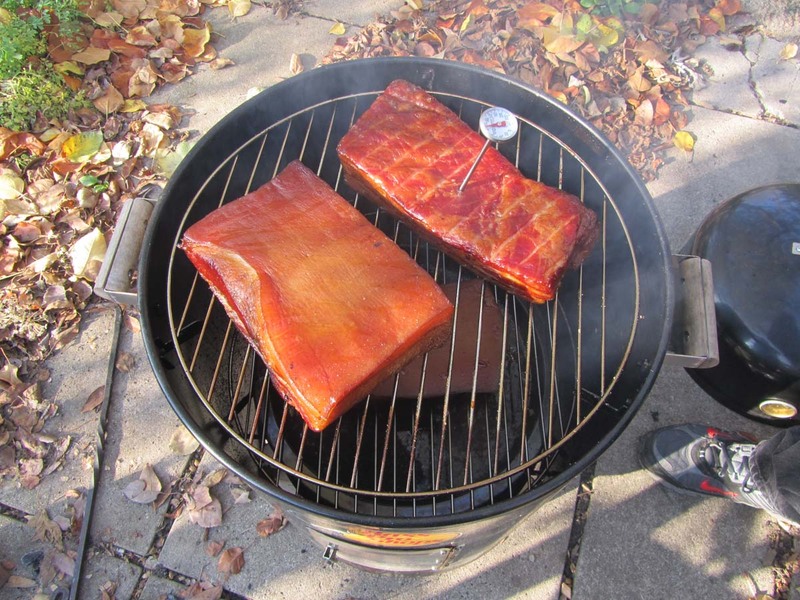 For smoking meats (ribs, chicken, beef, pork,) you need to do what’s called a “hot smoke”. That means you’re also cooking the meat slowly as it smokes. Since we’re talking about bacon here, you want the temperature to be between 200-250 degrees, no higher. If you go lower, it will take much longer to cook your meat – and you’re heading into cold smoking territory (something we’ll cover in the future). Too hot and the meat cooks to its final temperature without being exposed to the smoke for enough time to give it the flavor you want. What wood should you use? That depends. We’ve been trying different things. The first time out was apple, then hickory, then maple, and this last time was cherry. All gave very different results with hickory being the most assertive. Apple and cherry have many nice features, and the maple tasted a bit mild to my mind. But that’s the fun of doing this: you can experiment to your heart’s content. We get our fire started with the fire pan at the bottom about 1/4 full of lump charcoal. We soak our wood chips in water for about 1/2 hour then wrap them in heavy-duty aluminum foil, punching several holes in the package. The Brinkmann smoker has a water pan directly above the fire pan. We fill that about 2/3 full of water which easily lasts for the whole smoking period. This accomplishes two things: it adds moisture to the smoke (a great thing for cooking ribs and brisket) while keeping the heat from below reaching the meat directly. Then we put on our bacon and sit back. Using an instant-read thermometer, we monitor how the bacon is cooking. Our results show that about three hours of cooking time is about right. The flavor of the smoke on the meat is optimal. You know when the bacon is done when the internal temperature reaches 150 degrees. Now comes the payoff. Slice off a bit of your bacon and try it. We do this every time and every time it knocks our socks off. Before slicing (unless you’re serving right away), chill the bacon thoroughly. While it’s still hot, though, is the time to slice off the rind (unless you like it on). Have the rind side of the bacon up. Just slip a sharp knife under it, keep it pointed slightly upward towards the rind as you gently slice it off, making the sharpness of the blade work for you. And don’t throw that rind away! We cut it into squares and freeze it. It gives fantastic flavor to stews and soups. So to close off, anyone can enjoy some fantastic eating, avoid the “additions” that are put into store-bought, mass-produced bacon and not have to work very hard to do it. Since bacon freezes so well (we don’t eat it all that often), we just slice it and package it in air-tight bags, peeling off what we want, when we want. A few minutes in the frying pan or under the broiler and it’s ready. I will say it one last time: you will be amazed how easy it is to do and how great it tastes. where do you buy charcol?